[S1583] Richard Griffith, Griffith's Valuation, County Cavan, Parish of Denn, Dennbane, page 266. [S1584] James R. Reilly, Richard Griffith and His Valuations of Ireland, County Cavan, Poor Law Union Baileborough, page 81. [S1447] Rose Soraghan, Ballinanagh, County Cavan, Ireland, death certificate. [S2519] Patrick Sorahan, Ireland, Cavan, Bellananagh, Denbawn death registration, Copy of death registration from Eileen Sullivan, August 15, 2017. [S300] Michael Sullivan, Death Certificate. [S2745] The Daily Inter Ocean, January 3, 1881, Issue 245, column F, Accessed http://infotrac.galegroup.com, January 30, 2012. Occupation: He was an engineer with M. S. & N. I. R. R. in the engine house. In 1855, the Northern Indiana Railroad was consolidated with the Michigan Southern to form the Michigan Southern and Northern Indiana Rail-Road Company. In 1856, the line obtained the lease of the Detroit, Monroe & Toledo Railroad, then unfinished, and this finally connected the points named in its title. In 1869, the company was consolidated with the Lake Shore Railway (previously known as the Cleveland, Painesville and Ashtabula Railway, which had previously acquired the Toledo and Cleveland Railroad), becoming the Lake Shore & Michigan Southern Railway. The consolidation from Buffalo to Chicago was completed on August 10th, 1869, when the Buffalo & Erie Company came into the scheme, and this great railroad and commercial force of to-day became an accomplished fact. Death*: He died on 2 January 1881 at Chicago, Cook, Illinois, USA. SULLIVAN - At his residence 245 W. Taylor st., Jan. 2., 1881, Patrick Sullivan, brother of ex-Alderman Michael Sullivan of this city and Rev. P. F. Sullivan, pastor St. Edward's Church, Philadelphia. Funeral Tuesday, Jan 4, at 10 o'clock, by carriages to Holy Family church, thence to Calvary. Sullivan -- At his residence, No. 245 West Taylor street, Jan. 2, Patrick Sullivan aged 47 years, brother of ex-Alderman Michael Sullivan, and the Rev. P. F. Sullivan, pastor of St. Edward's Church, Philadelphia. Funeral Tuesday, Jan. 4, at 10 o'clock, to Holy Family Church, by carriages to Calvary. New York, St. Louis, Philadelphia, and Pittston (Pa) papers please copy. [S494] 1880 US Census, Illinois, Cook County, Chicago, Washington, DC, ED 86, sheet 8, line 8, (Ancestry.com http://content.ancestry.com/iexec/) Printed 22 August 2005. [S1473] Sullivan Grave Card, Lot 42, Block 16, Section N, Calvary Cemetery, Evanston, Cook County, Illinois, USA. [S567] Patrick Sullivan, Illinois Physician's Certificate of Death, Family History Library, MF# 1,021,431. [S611] New World, May 28, 1904, Accessed February 22, 2006. [S1307] Chicago Tribune, January 3, 1881, pg. 8, ProQuest Historical Newspapers, Chicago Tribune (1849-1987), accessed February 11, 2011. [S1143] Burial Register: entry for Patrick Sullivan, 4 January 1881 Holy Family Church, Chicago, Cook County, Illinois, USA, Family History Library, MF#1704693, Item 7, Wilmette Family Center. [S615] Baptismal registery, p. 21, Sullivan (Sorohan),Patrick, Baptismal record: Family History Library, MF#0926131, April 6, 1863, Denn Parish. [S615] Baptismal registery, p. 21, Sullivan (Sorohan),Patrick, Baptismal record: Family History Library, MF#0926131. Entry also listed at National LIbrary of Ireland, Denn microfilm 05350/04 https://registers.nli.ie/registers/vtls000634845#page/23/…, April 6, 1863, Denn Parish. [S615] Baptismal registery, p. 21, Sullivan (Sorohan),Patrick, Baptismal record: FHL #0926131, April 6, 1863, Denn Parish. [S2500] Patrick Soraghan, Monaghan Death Registration, Document provided by Eileen Sullivan, June 22, 2017. Death*: He died on 1 June 2013 at Glencar, Manorhamilton, County Leitrim, Ireland, at age 79. The death has occurred of Very Rev. Fr. Patrick Sullivan peacefully at his home. Reposing at the Parochial House Glencar, on Monday from 12 noon to 6 pm with removal to St. Osnat's Church, arriving at 8 pm. Concelebrated requiem mass on Tuesday at 12 noon with burial afterwoards in the church grounds. [S2440] Fr. 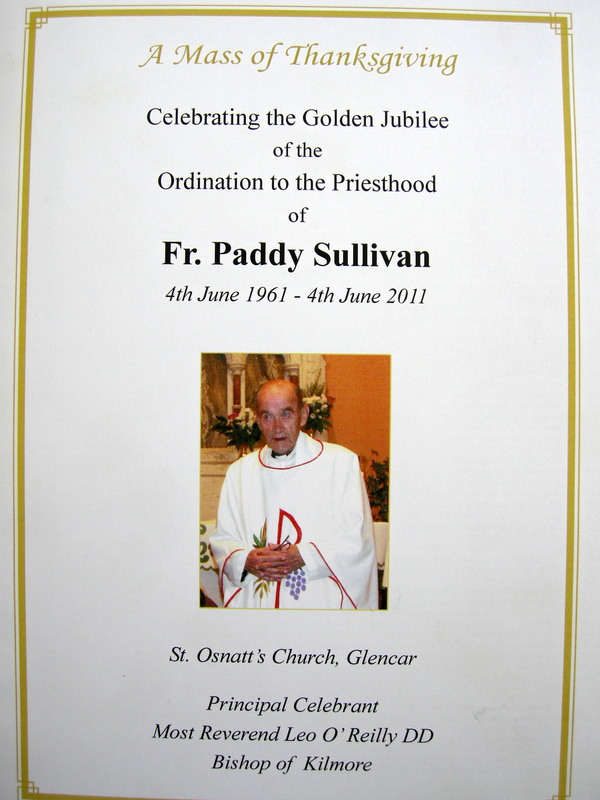 Patrick Sullivan, Celebrating the 50th Anniversary of Ordination Memorial pamphlet, 4 June 2011 Elaine McIntyre Beaudoin, personal files, Images of Fr. 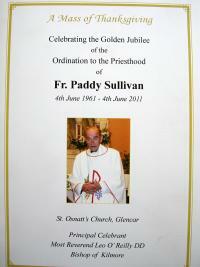 Paddy's Golden Jubliee pamphlet provided by Rita Galligan, August, 2011. [S2441] Bishop Leo O'Reilly, Homily at the Golden Jubliee Mass for Fr. Patrick Sullivan, July 8, 2011 Elaine McIntyre Beaudoin, personal files, Document provided by Eileen Sullivan, Feruary, 2017. [S665] Elaine Beaudoin's personal knowledge Elaine McIntyre Beaudoin, personal files, I telephoned from Cavan. Patrick Joseph Sullivan, age 71 of Gallatin passed away November 28, 2013. Mr. Sullivan was born on July 27, 1942 in Chicago, Illinois to the late George Peter and Helen Hardies Sullivan. He is survived by his children, John P. Sullivan, Donna L. Waner, Scott C. Sullivan and Christine J. Sheckler; siblings, Peter Sullivan, Dorothy Sullivan, Charlie Sullivan, Mary Keierleber, Kevin Sullivan and Jimmy Sullivan; grandchildren, Christopher Sullivan, Zachery Sullivan, Blake Waner, Carly Waner, Jessica Sullivan, Aaron Sullivan, Michael Sullivan and Ashley Cohee; great-grandchildren, Madeline Sullivan and Allie Sullivan; loving partner, Barbara Davenport and dear friend, Mary Sullivan. Funeral services will be conducted on Monday, December 2nd at 12:30 p.m. from the Chapel of Spring Hill Funeral Home. Interment will follow in Spring Hill Cemetery. Visitation with the family will be on Sunday, December 1st from 4 -8 p.m.
[S1676] Find A Grave, online http://findagrave.com, Helen Louise Taucke Sullivan Ritter, Memorial #44582260, created November 20, 2009 by Sue. [S2716] Spring Hill Funeral Home, November 28, 2013, https://obits.tennessean.com/obituaries/tennessean/…, Accessed October 9, 2018. Biography: In the graduate bulletin for Xavier University, there is listed a Paul D. Sullivan, S.J., professor of English. Needs further searching to determine if it is him. [S309] US Social Security Death Index, 1935-Current, Ancestry.com, Ancestry.com, accessed April 29, 2012, Paul Sullivan. [S1568] 1920 US Census, Missouri, St. Louis County, St. Louis, Washington, DC, Ward 17, ED 333, page 19A, Ancestry.com, accessed April 27, 2012. [S1570] Xavier University, Xavier University Bulletin, Google.com, accessed April 27, 2012. [S1566] Ohio Deaths, online Ancestry.com, Paul Sullivan, certificate no. 003463, volume 25517. [S1411] Peter Soraghan entry, Irish Civil Registration, Bellananagh, Cavan, Ireland, Source MF # 101197 (1869). [S2434] Peter Sullivan, Ballinanagh, Cavan, County Cavan birth registration Entry 112, page 89, code 02329233, Document provided by Eileen Sullivan from www.irishgenealogy.ie, Feburary 12, 2017 (Sep 4, 1864). [S2629] Peter Sorahan, Ireland, Ballinanagh, County Cavan, Denbawn death registration, Accessed February 22, 2018.